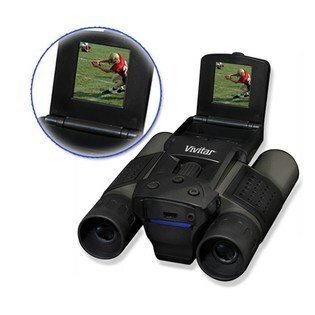 Today’s Deal of the Day at Sears is a Vivitar 8 MegaPixel Digital Camera Binoculars with 12x Magnification, Continuous Shot Mode & 1.44″ LCD Screen for only $29.99! I think these are pretty neat! I’ve never seen binoculars that also take pictures. You will be able to get those good sports shots even if you are far away and get up close to wildlife. I think for me I would use it for the wildlife. We often watch the seals down on the coast and I’ve always wished that I could get closer to get a picture. With this cool product, I could get some great shots! The built-in camera takes 8MP digital pictures that can be reviewed with an option to delete them on the 1.44″ LCD display. The binoculars have 12x magnification and a 25mm lens diameter for a 303 foot field-of-view at 1000 yards. Coated lenses and roof prisms capture clear, sharp images that can be stored on an SD memory card. Interpupillary distance is adjusted with a center focus wheel and the binoculars offer a 3-meter minimum focus distance. Want to grab a pair? Makes a great gift for a sports enthusiast or wildlife lover! Buy them today at Sears for $29.99! Wow, I’ve never heard of such a thing. What a great idea. I like to hike and bird watch so in addition to hiking gear, I carry a camera and binoculars. Maybe I should have 2 in 1? Wow, what a cool thing! They would definitely come in handy for a sporting event, huh? And what an excellent price!!!!! Wow – pretty cool! I could definitely see them for wildlife – my brother would love these! What a neat idea! Too cool. While they are very cool (technology these days, huh?) I am with Desiree- how do you get the picture from the binoculars? I’m guessing some USB cord or something of the same.